Mai Medhat, the co-founder and CEO of Cairo-based event engagement startup Eventtus has said that the fresh graduates in Egypt now a days prefer working for startups [like Wuzzuf, Instabug, and Eventtus] instead of joining the telecom companies or big corporates to start their career. 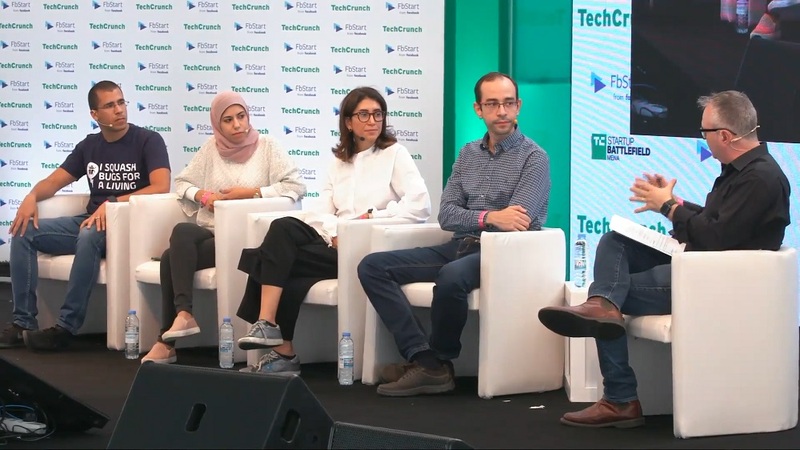 She made the remarks at TechCrunch Startup Battlefield MENA where she was part of a panel that also included Instabug’s Omar Gabr, Wuzzuf’s Ameer Sherif and Tarjams’s Nour Al Hasan. “What’s [happening] in Egypt right now is that corporate employees are actually more excited to join startups which is a great change in the mentality of community. Fresh graduates [for example], prefer to work for startups like Wuzzuf, Instabug, and Eventtus instead of joining the telecom companies or big corporates,” said Mai, responding to a question, by TechCrunch’s Editor at Large Mike Butcher who was moderating the panel. “It is because they see value or potential in it and prefer to be part of building something instead of being a small part of big corporate,” she added. Nour Al Hassan, the Jordanian co-founder and CEO of Dubai-based online translation business Tarjama, shared similar views, saying it wasn’t easy when she had started the business back in 2008. Nour, who has also founded Ureed, an online marketplace for linguistic and editorial services, recently, explained that people back in those days were too afraid to leave their ‘secure’ corporate jobs and join startups. From ‘your [company’s] name is not familiar’ to ‘we can’t leave our job to come and working for something that might close in few months’, she had heard all kinds of reasons from candidates who refused to work for her company when it had just started but now things have changed, “I see it both in UAE and Jordan”, she noted, confirming the trend of people preferring startups over corporates. Omar Gabr and Ameer Sherif also seem to have nodded with yes (not visible in the video though) when they were asked if they agree with what what Eventtus CEO had said. Ameer, having founded Egypt’s largest jobs website of Egypt, Wuzzuf, could’ve been the best person to share insights on this but the moderator Mike Butcher moved on to the next question before going back to Ameer. Omar, Istabug’s CEO, said that it has relatively easier for them, “We are very lucky because we are building a developer tool. It is something that is is very appealing for engineers to work on –something that they would probably use themselves — which has worked to our advantage. The panel talked about different other things as well. You can watch the full video here.